The Best of Branson's Hottest Ticket. ALL-NEW with new hits, comedy and fun! 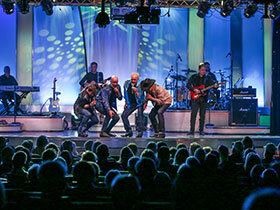 Pierce Arrow: Gold is a family friendly show that features clean comedy and a variety of music including: popular country, classic rock, Gospel favorites and patriotic melodies. The Pierce Arrow quartet features Dan Britton Guinness book of records holder for lowest bass voice for nearly 20 years. Featuring James Sibley, voted 2017 Branson Comedian Of The Year, and comedy writer for Saturday Night Live will leave you in stitches. For show times and ticketing information, check out Pierce Arrow Theatre!